Ergo Phizmiz is a composer, writer, collagist and artist working across opera, radio, songwriting, and installations. His work – including award-­‐winning radio commissions, critically acclaimed albums of songwriting, unique multimedia theatre works, and exhibitions – is broadcast and presented internationally, including BBC, WDR, Channel 4, Bayerischer Rundfunk, DePlayer, WFMU, Soundart Radio and Resonance FM. Bill Bankes-­‐Jones has directed all Tête à Tête shows, written the words of several, and masterminded all seven Festivals. He trained under the ITV Regional Theatre Young Director’s Scheme, and enjoys a busy freelance career – including, most recently, Hansel & Gretel for Scottish Opera (Director & Translator) and Entführung for Iford – and chairs the Opera & Music Theatre Forum. Isobel Smith, Artistic Director of Grist to the Mill, uses puppets, found objects and installation to produce powerful contemporary theatre. Isobel studied at Central Saint Martins (BA) and is a graduate of the Green Ginger ‘Toastie’ scheme. 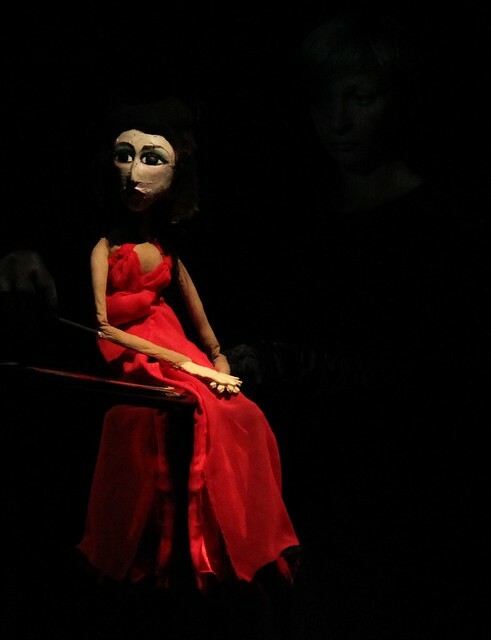 She has recently completed a Puppet Centre residency at Nuffield Theatre, Southampton. Timothy Burke read Music at Exeter College (Oxford) and trained at the Guildhall School, the National Opera Studio, and the Jette Parker Young Artists Programme (ROH). He conducted his own composition The Physicists at last year’s Tête à Tête: The Opera Festival, and previously conducted Der Jasager, Trouble in Tahiti and The Crocodile at the Grimeborn Opera Festival. James Young is an MD, pianist and composer working across many genres: from opera and experimental music theatre to pantomime, work with These New Puritans and Shirley Bassey, from song and piano-­‐duo recitals at Wigmore Hall to tours with Piano Circus, and from commissions for incidental stage music to an upcoming Sydney premiere with 4 Girls 4 Harps. A graduate of the Guildhall School of Music and Drama, Claire Bamford works extensively with Trinity Laban Conservatoire of Music and Dance as Stage Manager and Deputy Stage Manager for their musical and opera productions. Claire also toured a production of Don Giovanni with Mid Wales Opera last year. Teele Uustani is a puppeteer and performer. She studied puppetry at the Central School of Speech and Drama, and is currently doing physical theatre training at London International School of Performing Arts. Previous work includes: King Harald’s Saga (CSSD/Trinity Laban Conservatoire), The Man Who Wasn’t There (Genius Sweatshop). Darren East is a puppeteer, director and performer, and associate artist of the Little Angel Theatre (“home of British puppetry”). He works regularly with applied puppetry company TouchedTheatre (www.touchedtheatre.co.uk), Unpacked Theatre (www.unpacked.org), and new puppetry-­‐opera company Third Hand, as well as teaching and running a range of participatory arts activities (www.darreneast.co.uk). Becca Marriott began her career as a comedienne and actress. Her operatic roles include: Amelia Un Ballo in Maschera, Title Role Tosca, Dido Dido & Aeneas, La Contessa La Nozze di Figaro, Donna Anna Don Giovanni and Serpina La Serva Padrona. She will be performing Tosca for OperaUpClose at The Soho Theatre this summer. Alex Gilchrist is delighted to be taking part in this Tête à Tête and Puppet Centre collaboration through Trinity Laban (where he trains in Musical Theatre), and to be creating the role of Jeff Fenholt in Gala. Some of Alex’s other roles include Anthony Sweeney Todd and understudy Robin Robin Hood at Greenwich Theatre.